Michael Propster in Navigator in Love. Photo by Isaiah Tanenbaum. 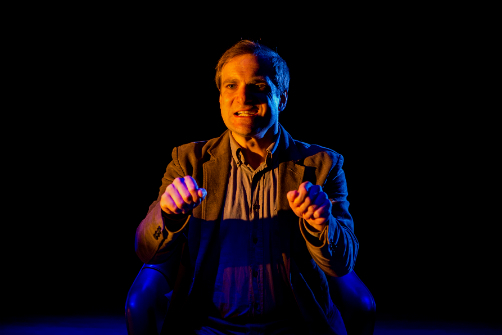 BOTTOM LINE: In the new play by Georgian playwright Lasha Bugadze, a love affair between a man and his GPS becomes a universal emblem of loneliness. Can you imagine if your GPS not only would tell you where to turn, but also give you style advice, spy on your colleagues, and amuse you with pictures of an imaginary future? Lasha Bugadze explores the relationship between human and machine in Navigator in Love, currently running at Teatro Circulo as a part of the Georgian-American Theatrical Feast. If you have watched the 2013 Spike Jonze film Her, you can probably guess some of the pitfalls of this kind of romance. The movie, however, takes place in the near future, while Bugadze's play is about the not-so-recent past and takes place in the Republic of Georgia. Rostom (Michael Propster), a working stiff in his 40s, gets a promotion and a car equipped with a GPS. He is assigned to inspect a few construction sites and is hesitant about the new responsibilities. All four of the locations are in conflict zones. Rostom hasn’t driven in ten years and he has a sick father who is scared to be left alone for a long time. But as he starts driving and talking with his GPS, the road suddenly feels like liberation from the oppressive office atmosphere and pent-up anger towards his family. But is this a road to empowerment or to madness? Navigator in Love is presented as a futuristic love affair between a man and an artificial intelligence. But as such, it feels a little shallow. No matter how many turns and roundabouts Rostom takes, guided by his GPS, their “love story” beelines towards the dramatic finale and just scratches the surface of the possibilities. The “side road attractions” that Bugadze’s play leaves behind are sometimes more interesting than its main conflict. Clenching the invisible steering wheel, rotating in his office chair in the middle of the darkened stage, Rostom casually mumbles at some point: “There are Russian tanks on this road, we can’t turn here.” Another haunting moment occurs when the head of the Rostom's department awkwardly jokes that the new residential and recreational zones that he's been sent to inspect are near the conflict zones. Moments like these are startling, especially considering characters’ easiness and even boredom with the constant state of alarm. Political turmoil in the region merely serves as a distant backdrop for the story of one's loneliness and inability to find support in one's fellow human beings, whether family, friends or love interests. The cast, under direction of Adam Knight, truly makes the play and the workplace drama is the most enjoyable aspect of it. Balancing between subordination and human connection—sometimes clumsy, sometimes forceful, sometimes sincere, sometimes pitiful—fuels the story. Out of seven very talented actors, I would especially acknowledge both Masha Dakic as Clara, Rostom’s office crush, and Brett Epstein as Jakeli, his office pal. The vixen Clara, sucking on watermelon and checking out her perfect legs during the lunch break with meek Rostom, is a textbook example of how one can flirt and reject at the same time. Dakic deliberately takes her performance over the top, as every day at the office is a one-woman show for this drama queen. Epstein takes on the function of comic relief, mentioning his medication and swearing on his dead brother’s grave in every other scene. There are a lot of comedic moments like these in Navigator in Love, but counterbalanced with its Kafkaesque anxiety, it doesn’t seem funny at all. Navigator in Love is by Lasha Bugadze. Directed by Adam Knight. Produced by Red Lab Productions. Set Design is by Adam Knight. Sound Design is by Toby Algya. Lighting Design is by Lauren Duffie. Costume Design is by Irina Gachechiladze. The cast is Alan Altschuler, Masha Dakic, Rose DeGraw, Brett Epstein, Michael Propster, Lauren Riddle and Owen Scott.